Stakeholder engagement is the basis for good corporate governance. It plays a critical role in building support for the company’s initiatives. 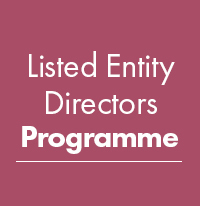 This module aims to instil an appreciation of the range of stakeholders of the enterprise and covers the duties of the board in relation to these stakeholders. Understand the importance of providing effective organisational accountability to key stakeholders. Know the obligations of the board in relation to stakeholder rights and sustainability agenda, and providing accurate and timely corporate reporting and disclosures. Appreciate the importance and nature of investor and media relations, and how to prepare for and be proactive in responding to crisis.